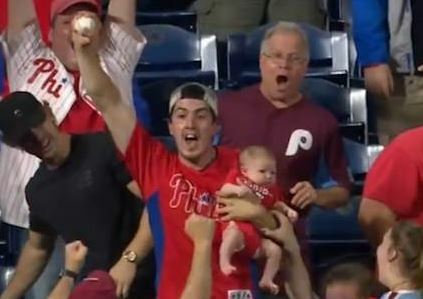 WATCH: Baseball fan’s brilliant catch … with a baby in his arms! The baseball fan's great grab. Photo: Screengrab. American sport fans are known for not being particularly averse to taking young children to big events. A Philadelphia fan had the crowd in raptures following a stunning one-handed catch in a Major League Baseball match between the Phillies and Los Angeles Dodgers. But the really impressive … or downright scary thing about that grab was that the man, a Phillies supporter, did so with a baby in his other arm! American sport fans are known for not being particularly averse to taking young children (very young in this case) to big events.